These candies are a delicious paleo friendly Valentine’s Day treat. Place the jar of coconut butter in a small bowl of hot water to soften. Pour the strawberries and the bananas in a food processor and pulse until they are a fine powder. Add the coconut butter and honey in the processor with the powder and blend until smooth. Pour this mixture into a squeeze bottle and fill the heart candy molds. Place the molds in the refrigerator for about fifteen minutes or until the candy is set. Melt the chocolate bar in a small pan over low heat with the 6 tsp of honey and palm shortening. Stir constantly until melted. Remove the mixture from heat and allow to cool for fifteen minutes. 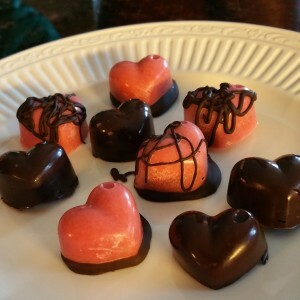 Dip the hearts in the chocolate mixture and place on parchment paper or drizzle the chocolate over the hearts. Pace the candy in the refrigerator for fifteen to twenty minutes to set. Store in the refrigerator. Try not to eat all the delicious little buggers!